It’s no secret that students learn best when they have the ability to play with math. Manipulatives give students the opportunity to explore how numbers work and develop deep conceptual understanding of important math concepts. I get asked quite often what my favorite math manipulatives are and when to use them throughout the year, so I thought it was finally time to write this post! Let’s dive into my list of must-have math manipulatives for upper elementary classrooms by focusing on the major work for third, fourth, and fifth grade math. This post contains affiliate links. Please review my full disclosure policy for additional information. Understanding our base-ten number system is a foundational concept that needs to be developed concretely over time. Yes, that means students need lots and LOTS of experience with manipulatives to recognize patterns in place value. Although as adults this may seem like an easier concept, it most definitely is not for elementary students. Why two 1's can have different values depending on their position can be incredibly confusing if students have not had plenty of experiences developing their understanding of place value. Place value is actually a pretty abstract concept, so we have to give students opportunities to build to the abstract understanding by starting with the concrete... manipulatives. My favorite manipulatives to develop place value understanding are base-ten blocks. I highly recommend getting a class set of base ten blocks, but if you are just starting out and are low on funds, you can always get the starter set of base ten blocks and use them in small groups or centers! If you have nothing else, you MUST have base ten blocks (also called place value blocks). These can be used for developing place value understanding with whole numbers and then they can also be used for exploring place value with decimals. Get these and play with them ahead of time. You'll be surprised how working with manipulatives will develop your own understanding of our number system! It is so important that we have a whole lot of manipulatives available to students as they begin learning how to add, subtract, multiply, and divide whole numbers and decimals. A lot of times teachers use manipulatives to develop foundational understandings of numbers and then quickly jump to procedures and algorithms when it's time to begin operations. I cannot stress this enough. Students will struggle to have long-term success and will lack flexibility in their thinking if we do not begin with concrete examples first. Math manipulatives are JUST AS important, if not MORE IMPORTANT when we are working with manipulating numbers as they are when we are developing a foundational understanding of the numbers themselves. Operations are actions and students need plenty of experience playing with and doing these actions before we expect them to understand them in abstract ways. I actually have this exact classroom kit of play money sitting in my Amazon cart ready to be purchased. I've been borrowing this kit for several years from a teacher friend who no longer teaches math, but it is finally time I get my own! Money is an incredibly visual tool that most students already have some prior experience with. This allows you to get straight to the math and focus on what is actually happening when we begin "doing things" with numbers! Pair play money with your base-ten blocks and you have everything you need to explore some tough math concepts that students frequently get hung up on. These manipulatives are my go-to's when students are working with regrouping or discovering the division algorithm, as well as work with many other concepts. Does this tool easily allow students to relate the size of the part back to the whole? This sounds like "I know this is 1/4 because it fits into the whole 4 times." It's about the students identifying the relationship between how many times the part fits into the whole. It's not about the label of the piece. Does this tool let me stretch students' ability to think flexibly about fractions? This sounds like "If this [points to piece A] is a whole, then this [points to piece B] is 1/4, but if this [point to piece C] is a whole, then this [points back to piece B] is 1/2." The whole is not a single piece, but can be any piece. Again... It's about the relationship between the part and the whole, not the label of the piece. Does this tool require students to reason about fractions instead of using the tool as a crutch? This is a big one. It IS possible for students to use fraction manipulatives and still not develop fraction sense. Hopefully if we've paid close attention to the first two questions, then the third will be much less likely to happen. It is all about how we use the manipulatives. If you are someone who already has a library of math manipulatives, this section might make you think a little bit about which manipulatives you gravitate towards when working with fractions. Here are my three favorite fraction manipulatives that I use in my own classroom! Hands down, my absolutely favorite fraction manipulatives are pattern blocks! Are you surprised? Pattern blocks meet the "requirements" of all three of the questions above! There are no labels (which I love because students have to determine for themselves what the size of the part is and why it's that size) and the whole can be any of the pieces (lots of flexible and critical thinking!). Another surprising "manipulative" that makes my favorites list are non-sticky post it notes. I'm not sure if that is an official name for them (and honestly normal post-it notes would work just fine), but since students use these by cutting and tearing them into parts, it's nice to not have any stickiness on them! Seriously, it's amazing how powerful little squares of paper can be for developing students' understanding of fractions, ESPECIALLY when we get into multiplying and dividing fractions. Students actually get to DO the math with their hands, which is so much more memorable and meaningful! My other go-to fraction manipulative are these fraction tiles. I have to be careful with these though... Because they are labeled, I typically wait to bring these out until I am sure that students have a strong understanding of fractions. I absolutely do not want them to rely more on the labels than on their own thinking and reasoning. A great example of this would be when students are comparing fractions. I would rather hear students say, "I know 1/3 is smaller than 1/2 because when you cut something into 3 equal pieces, each piece is going to be smaller than when you cut something into 2 equal pieces." What I don't want to hear is "1/3 is smaller than 1/2 because the 1/3 block isn't as long as the 1/2 block." Do you see the difference in the level of thinking required for each of those responses? Nonetheless, I think these rectangular fraction tiles are extremely valuable for growing students' understanding of fractions if they are used the right way! A FANTASTIC alternative to the fraction tiles mentioned above are these blank fraction tiles. When I discovered these, I was IN LOVE! I have yet to see these offered in a class set, but I have several sets myself! I get all the benefits of the fractions tiles (like having a variety of denominators, which is one of the limits of the pattern blocks), but eliminate the part of the fractions tiles that sometimes inhibits deep thinking! Developing measurement concepts requires very little in the way of purchased manipulatives because there are so many tools, objects, and everyday items around the classroom that you can use throughout your measurement units! Despite all of the resources found in our classrooms, I still find it important to have a structured or uniform tool to use to build measurement concepts and these connecting cubes are wonderful for that! I cannot find the exact set that I personally use, but these are no different. You just want to be sure that the cubes can connect on all sides. This is especially important for area and volume. When students are building rectangles and prisms, you want them to be able to build these shapes without their models falling apart. These cubes are also very versatile and can be used for place value or fractions (when you are discussing part of a set instead of part of a whole). You can't go wrong with simple connecting cubes! There you have it! 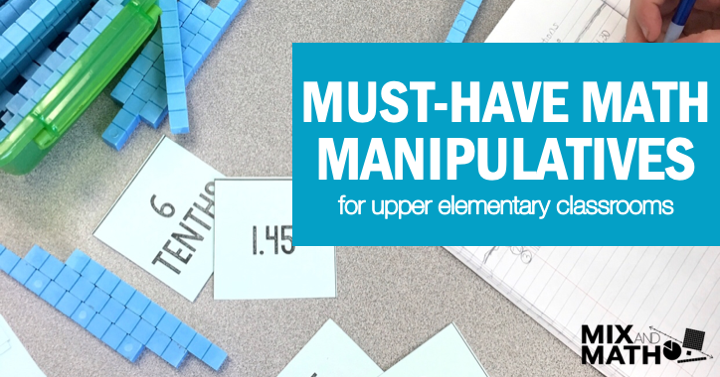 My MUST-HAVE list of math manipulatives for upper elementary classrooms! Are there more manipulatives that would be absolutely wonderful to have in your classroom? Absolutely! Trust me. I am a math manipulative hoarder. This list truly is a list of the MUST-HAVES for the major work of our upper elementary kiddos. I tried to keep this list as concise as possible because "ain’t nobody got time" to buy all the manipulatives in that catalogue sitting in your school mailbox. So, if you’re starting from scratch, buying new manipulatives out of your own pocket, or just trying to get an idea of what you need to be prepared for a new school year, there you go! I highly recommend looking at the standards, identifying the "major work" for the grade level, and then asking your principal if there are any funds for purchasing these student supplies. If that is not an option, set up a Donor's Choose project or reach out to local businesses (or BOTH!) and explain the importance of hands-on tools for students' success in math! Students learn by doing and hopefully you can get some of these tools for your students to play, learn, and discover new math concepts!